We turned first to the ultimate bunner – Mrs Beeton in her Household Management Book of 1861, who tells us that these buns have an Average Cost of 1d. each. Good to know. 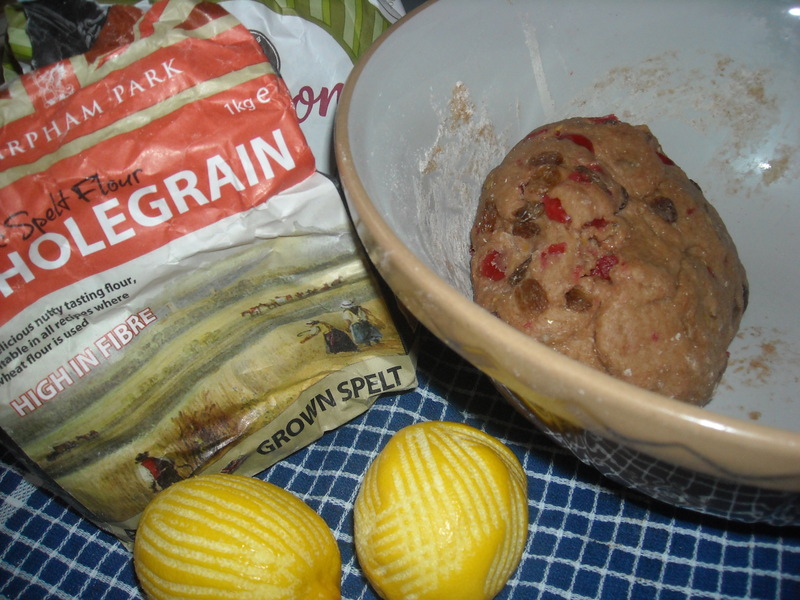 Mix the flour, sugar, spice and currants; make a hole in the middle of the flour, put in the yeast and a quarter of a pint of warmed milk; make a thin batter of the surrounding flour and milk and set the pan covered before the fire until the leaven begins to ferment. Put to this mass a quarter of a pound of melted butter, add the salt and beat well together. Make up into rather a soft paste with all the flour, using a little more warm milk if necessary. Cover this with a clean cloth, and let it once more rise up for half an hour. Shape the dough in buns, and lay them apart on buttered tin plates or baking-sheets in rows at least 3 inches apart to rise for half an hour. Place a cross mould on them (this may be done roughly with the back of a knife), and bake in a quick oven from 15 to 20 minutes. Unfortunately we had no fire to “set the pan covered before” so we had to improvise. Also we had to guess what a “quick oven” means…quite hot?! Grease a baking tray. Place yeast, milk and 1 tablespoon sugar in a bowl. Whisk to dissolve yeast. Cover. Set aside in a warm place for 10 minutes or until foamy. Sift flour and cocoa into a bowl. Rub in butter until mixture resembles fine breadcrumbs. Make a well in centre. Add yeast mixture, egg and remaining sugar and stir to combine. Turn dough onto a lightly floured surface and knead for 1 minute. Transfer to a lightly oiled bowl, cover and set aside in a warm place for 1 hour or until doubled in size. Punch down dough. Turn onto a floured surface and knead for 5 minutes or until smooth. Add choc bits and combine. Roll into 16 balls and place on prepared tray. Cover and set aside in a warm place for 30 minutes or until slightly risen. Preheat oven to 200°C. Meanwhile, make the paste – combine flour, sugar and 2 1/2 tablespoons cold water in a bowl. Spoon into a snap-lock bag. Snip 1 corner from bag and pipe crosses (or bums) onto buns. Bake for 10 minutes. Reduce heat to 180°C. Cook for 20 minutes or until golden and cooked through. When the buns come out of the oven, mix 1 tblsp of sugar and 1 tblsp of boiling water together for the glaze, and brush each hot bun with it. Heat the milk, butter, zest and clove until the butter melts, then leave to infuse. Measure the flour, yeast and dried fruit into a bowl and add the spices. Take the clove out of the milk and beat in the egg then pour this liquid into the bowl of dry ingredients. Knead the dough until you have silky, elastic dough. Form into a ball and place in a buttered, covered bowl and leave to prove overnight in the fridge. Next day, preheat the oven to gas mark 7/220ºC. Take the dough out of the fridge and let it come to room temperature. Punch the dough down, and knead it again until it is smooth and elastic. Divide into 16 balls and shape into smooth round buns. Sit the buns on a lined baking sheet. Score the tops of the buns with the imprint of a cross (or a bum). Cover with a teatowel and leave to prove again for about 45 minutes – they should have risen and almost joined up. Brush the buns with an egg wash, and then, as in the previous recipe mix flour, sugar and water into a smooth, thick paste. Pipe your pattern over the buns in the indents, and then bake in the oven for 15-20 minutes. Glaze with a sugar glaze when they’re out of the oven as in the choc chip recipe above. Here’s a fine selection of buns ready for tasting. 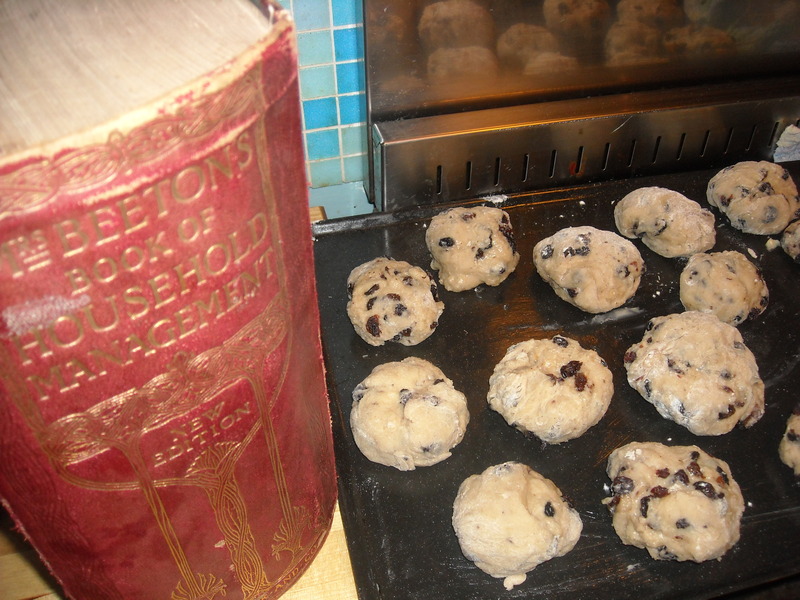 From left to right – Cherry Spelt, Mrs Beeton’s, Choc Chip. We tried the buns loaded with butter while still warm from the oven. A bit more spice wouldn’t have gone amiss but all were tasty. Next morning however they came into their own and made for an excellent breakfast. Mrs Beeton’s and the Spelt Buns were comfortingly breakfasty toasted with butter and the choc chip ones made a calorific luxury morning treat toasted and spread with Nutella, mmmmmm. Pre-heat the oven to 160°C (gas mark 3) and grease a 1-litre ovenproof dish. 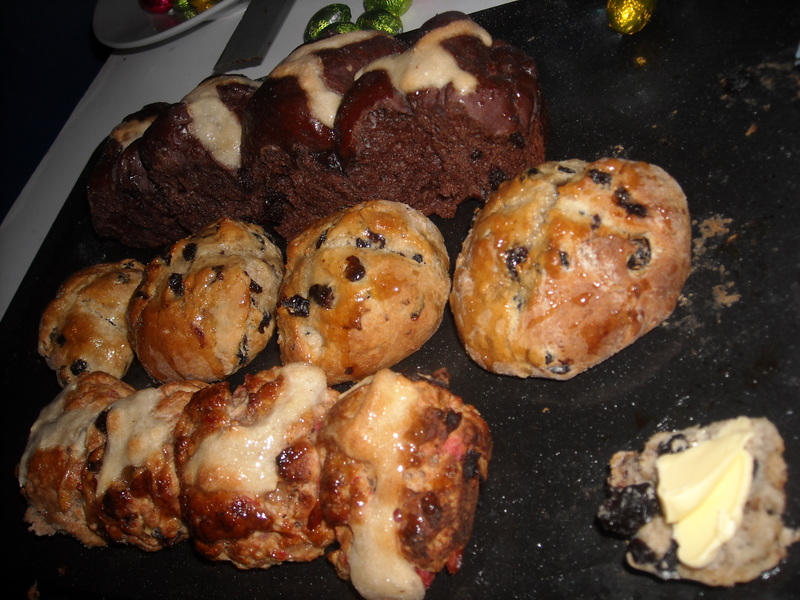 Cut the hot cross buns in half and spread with butter both sides. 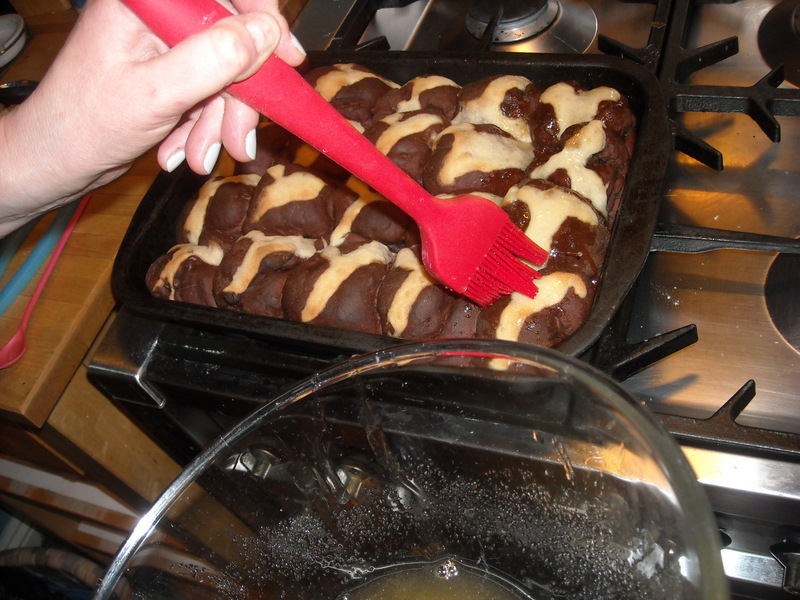 Arrange the buns in an ovenproof dish, layering the cross sides face up on top. Beat the eggs and egg yolk. Heat the cream and milk until just warm then pour into the eggs and whisk thoroughly. Add the yogurt, whisk again. Pour the mixture over the buns a little at a time, ensuring it has time to soak in. Sprinkle the pudding with demerara sugar and place on a baking sheet. 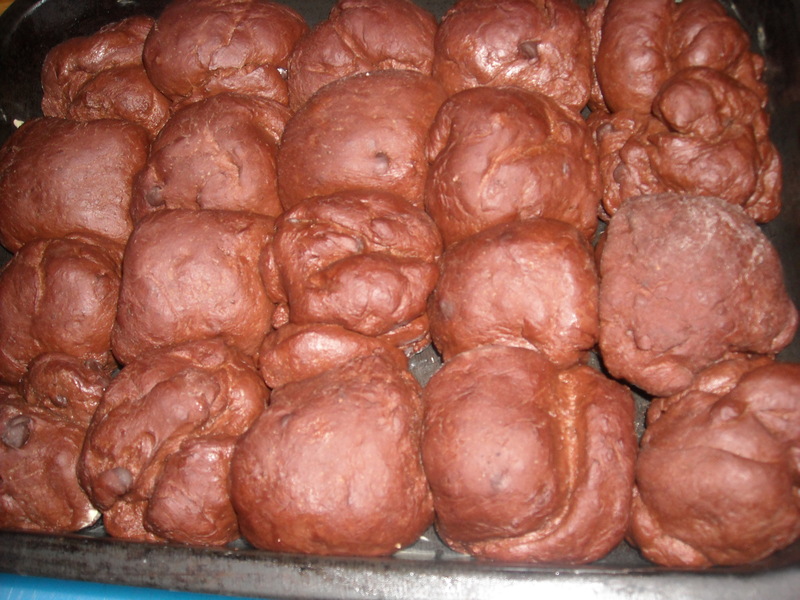 Bake for approx 30 mins – the pudding should be puffed up, set and golden brown when done. 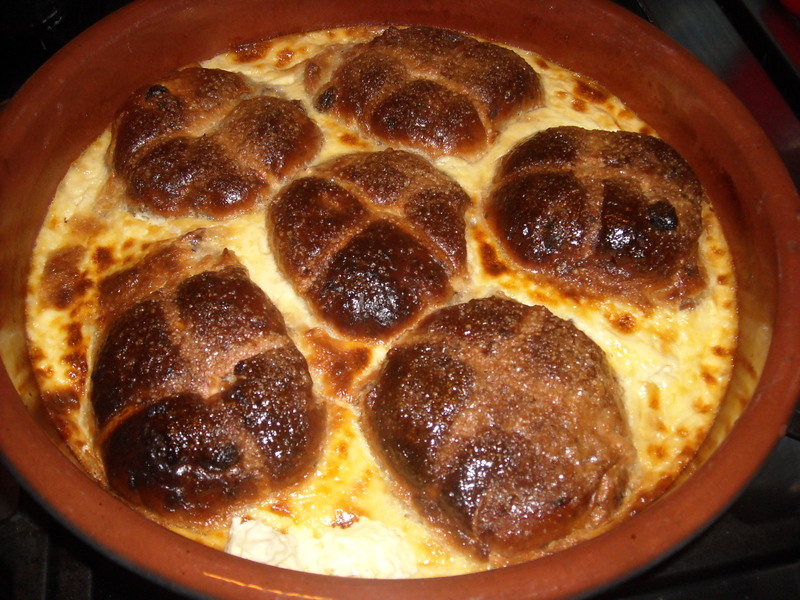 This turns out like an eggy custardy bread and butter pudding – nice. We drank… Another gingery cocktail – Raspberry Ginger Fizz, a cross between two of our favourites – a mojito and a Moscow mule. Raspberries, vodka and mint topped up with ginger beer. LUSH. We talked about… Fanny Craddock, Julia Childs, Mrs Beeton, Amour (the film), impending weddings, blood donating, Michelle Obama dancing, cameras, the Watts Gallery, Justin Timberlake, pubs in Puttenham. This entry was posted in baking, Easter and tagged baking, breakfast, bums, buns, cocktails, ginger, hot cross buns, Mrs Beeton, raspberries. Bookmark the permalink. Did you know that The Watts Memorial Chapel is very near Farnham in Compton? It’s wonderful, especially if you like the pre-raphs and art nouveau. Oh, and tiles. Great – I’m hungry now! Sounds like you had a busy evening. Any tips for left over crumpets? My husband purchased a family pack of them this morn and there’s only two of us? yikes, sorry…only just seen this comment! Guess those crumpets are gone now? !